The best Christmas crafts are ones you can make and then give as a gift. 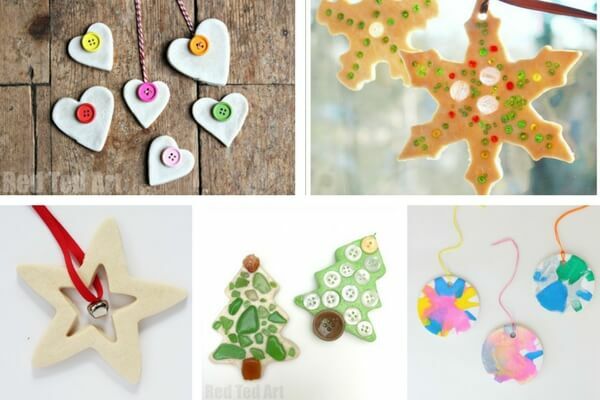 That’s what makes salt dough ornaments the perfect Christmas craft since you can give these as gifts too! 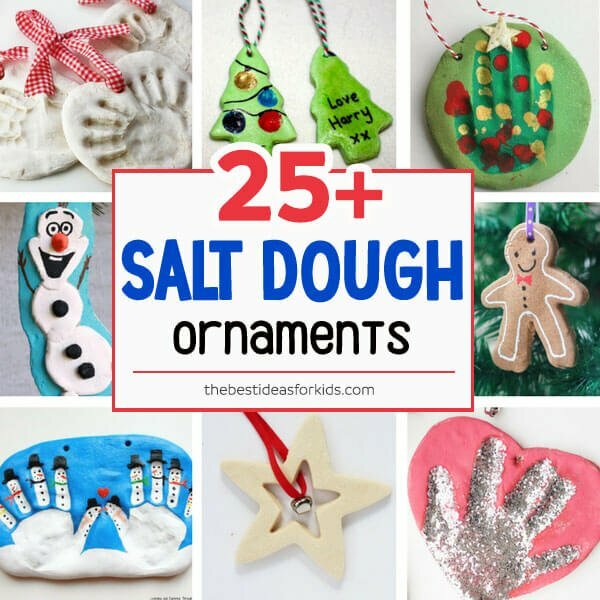 So we’ve found over 25 of the best salt dough ornament ideas to make with kids. And be sure to visit our salt dough handprint ornament – one of the most popular salt dough ideas on our site! We’ve broken down the different salt dough ornaments into different sections for you to make it easy to find the perfect salt dough Christmas ornament! 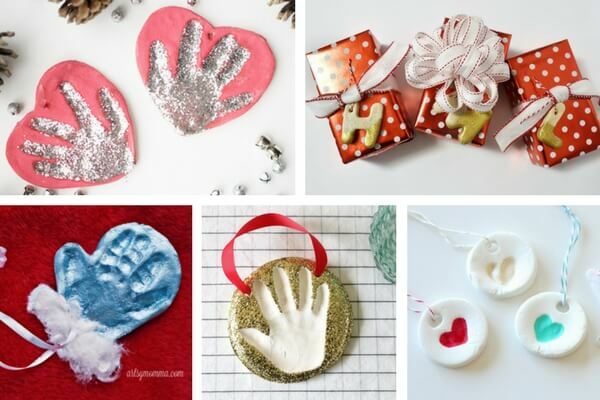 What better way to preserve those little handprints and fingerprints than with these lovely ornament ideas? 1. 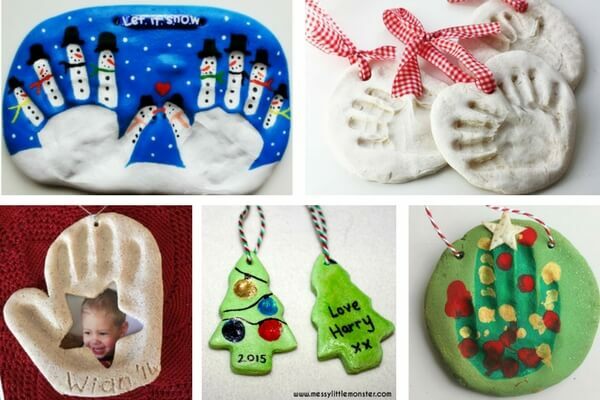 Salt Dough Handprint Ornaments– Our most popular salt dough idea – this has our easy salt dough recipe too. A must try! 4. Baking Soda Clay Handprint – with clay but you can easily make them with salt dough too. Get our salt dough recipe here. 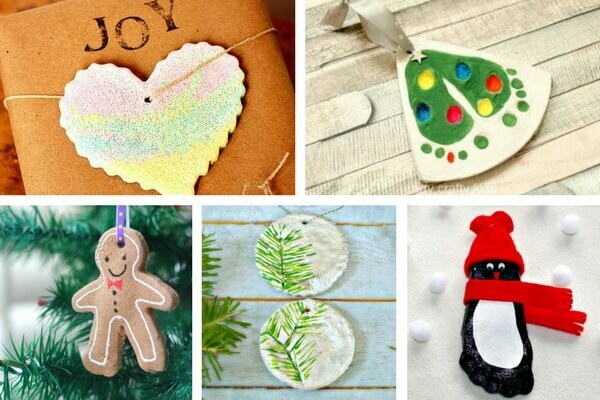 We love all of these ideas including hearts, snowflakes, stars and Christmas trees – all of these would make perfect handmade Christmas gifts! And that’s a total of over 25 of the best salt dough ornaments we have found! 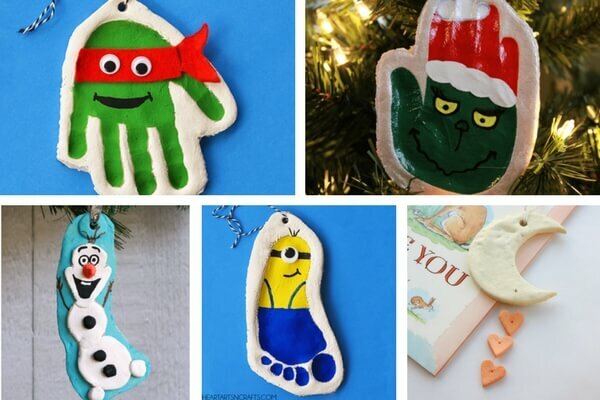 If you’re not the best at painting yourself, see these adorable handprint ornament ideas from the Baby Handprint Co here. And don’t forget to see our most popular salt dough ornament, these Salt Dough Handprint Ornaments! 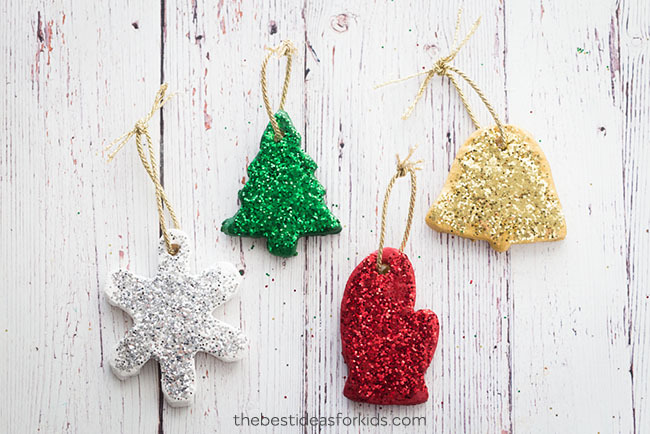 See these simple glitter salt dough ornaments. 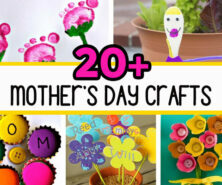 Kids will love helping to make these! 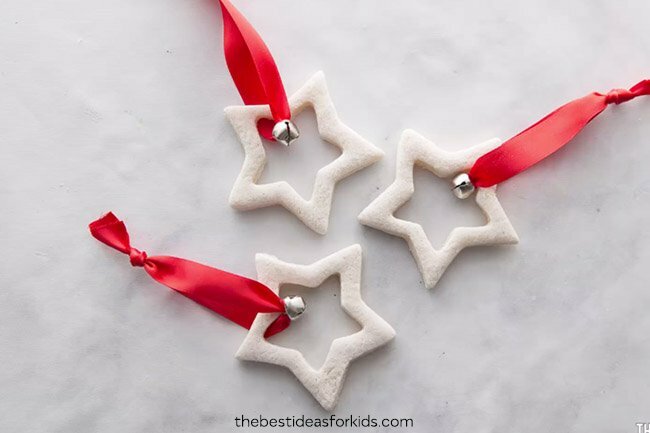 And for a simple ornament gift idea – these star ornaments are so easy to make! And here our favorite keepsake kits that make it easy to make a handprint or footprint keepsake! “Bula vinaka !” from Fiji . I love love love watching your videos. Your ideas make the perfect Christmas ornaments (*. *) -Brilliant idea to keep my sons & I busy this festive season. Keep those great ideas coming. Thank you! Happy to have you here. Mine are completely dried now just to decorate. There is plenty of dough to make ornaments for the whole family! I will be making the Ginger Bread one for the kids in the neighborhood.. There are too many to buy gifts for so i thought this would be a good gift Idea.. Keep those terific idea’s coming.. Crafty Lady in Michigan..
Where is your salt dough recipe?? Hi. I don’t have a lot experience with dough. How was this supposed to feel after 10 minutes of kneading it? Should it ball up, little bit wet, or completely dry? A little wet but not too sticky is good. If it’s too sticky you can just add more flour. If it’s too dry then you want more water. You want it to roll out nicely like we show in the video. We haven’t had ours crack but some thoughts – did you knead for 10 minutes? You could try adding more water to see if that helps. How sturdy are these once baked? Will they break if they fall off the tree or I drop them? I would be definitely be careful with them but they should be fairly sturdy. I’ve had one that I made when I was 7 years old and I’m 52. How do u get the handprints to turn out so Good? So u can see them. You may need to make the dough a bit softer by adding a touch more water if you find the imprints aren’t turning out. Do you paint them before they go in the oven or after? I am making the dough at home and taking to school for 28 kids. How much dough do I need for the circular handprint ornament? Also, how long can they sit out before I bake them? Hoping I can let them dry a bit at school before I transport them. Any suggestions on how to mark them with a name so I know who the ornament belongs to? Depending on your size and thickness you should be able to get at least 6 with one batch, but if you make 1 batch then see the sizing to see how much more you’ll need. I would guess you could probably do with 3-4 batches. You can definitely let them air dry before transporting or baking. Can you mark on wax paper before they harden and then once painted you can write the name on the back with an oil based paint marker? I would put some baking paper on a tray, put each finished ornament onto it then write the childrens names underneath it. That way you can transport the trays easily home to bake. Once baked, simply write the name on the back of the corresponding ornament. Love the ideas for my granddaughter for her and I to do ..we love to do crafts!! I love the idea and tried to do as shown but mine puffs up inthe oven, i have tryed to roll it thiner. Happy Thanksgiving… are you sure you aren’t using self rising dough? That would definitely make them puff up. Are you using self rising dough? This brings back such good memories of when I was in school. 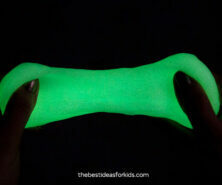 I can’t wait to make them.. Thank you ?? Good ideas for my boys keep them busy. Thank you for this post. I have 2 littles so these are great ideas as gifts for the grandparents!